Leinster (Lagin), a traditional province in southeastern Ireland, incorporates the areas of the ancient kingdoms of Leinster and Meath. 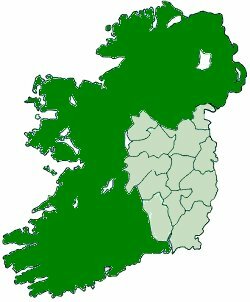 It has an area of 19,632 sq km (7,580 sq mi) and contains the present-day counties of Louth, Meath, Westmeath, Longford, Dublin, Kildare, Offaly, Laois, Wicklow, Kilkenny, Carlow, and Wexford. In ancient times, like Munster, it had no clearly defined capital and did not include Meath or Westmeath. Leinster also shares the Fionn Cycle with Munster. In Co. Kildare, near Naas, is the Hill of Allen. This large hill protruding above the surrounding bog, legend has it, was the site of the camp of Finn and the Fianna.